I just am so very very sick of all of it. I'm sick of racism, the xenophobia, the bigotry, the misogyny. Sick of writing about it, sick of reading about it and sick of it happening. I cannot even begin to tell you how much it hurts my heart and soul. Time and time again I have to return to this subject, because if I don't, then the hate will build up within me that mirrors the hate they sow. I refuse to let that happen to me. I refuse to let hate win. I was personally called overly-sensitive when I objected to someone for calling the President a n*gger. I was told the justification for using that word was because it's the same as calling me white. The anger in my heart started to boil. I can no longer tolerate the hate, and the roots from where it comes. It makes me hurt inside. It makes me sad. It really wounds my soul. So here I am trying to heal it by writing about it again. In a statement to the Washington Post today, Johnson -- who co-chaired McDonnell's Inaugural Committee this year -- condemned McDonnell's decision to proclaim April as Confederate History Month, calling it an "insensitive disregard of Virginia's complicated and painful history." "The complete omission of slavery from an official government document, which purports to be a call for Virginians to 'understand' and 'study' their history, is both academically flawed and personally offensive," she wrote. People are actually saying this declaration is a good thing, not because of the 'tourism' McDonnell said he thought it would promote, but for political reasons. "It helps him with his base," said Mark Rozell, a political scientist at George Mason University. "These are people who support state's rights and oppose federal intrusion." Said Patrick M. McSweeney, a former state GOP chairman: "I applaud McDonnell for doing it. I think it takes a certain amount of courage." 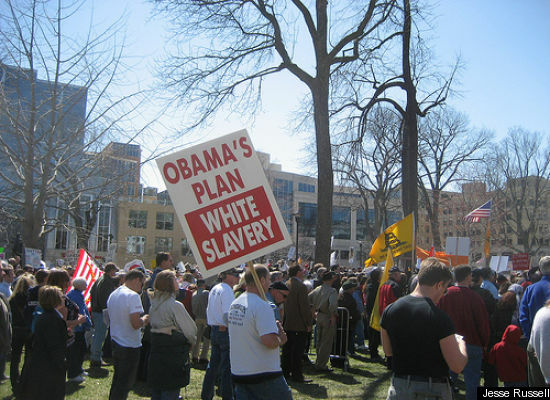 These are the very same issues that begat the first civil war: states' rights and slavery. We all know how that turned out. To be nostalgic over such a painful history - not only for Virginia, but to the entire country - is incredibly disturbing. Yet this is where we are in America today. They're lucky we brought them out of Africa. Why can't the blacks let it go? It was about state's rights, not slavery. It doesn't matter anymore because we don't have slaves now. White men built this country. But hey-- Governor McDonnell is just appealing to his base and tourists, right? We live in a post-racial society where it's finally okay to celebrate the Confederacy in this nation, right? People should just be over it already, right? No-- it's wrong. Damn straight I am sensitive to this issue. I pray I never get over it, because then - hate wins.